Should You Try the Low Nickel Diet? Many of you ask me whether or not you should try the low nickel diet? The low nickel diet involves limiting your intake of foods high in nickel. I will always suggest you seek medical advice. My personal nickel food allergy journey may not be anything like yours, even if we can relate. Eczema and food allergies are both very individual conditions and only you and your doctor truly know what’s best for you. My personal story involved living with terrible eczema all over my face, eyelids, neck and inner elbow for over 9 months. My eyes itched and were so pink, you would have probably wondered if I had pink eye. I don’t want to discount anyone’s symptoms. Living with unusual symptoms that are painful and embarrassing is very challenging and emotionally draining. Our bodies are trying to tell us something is not right, but we struggle to determine what’s really happening. These reasons are why I sought medical care. I visited my primary care physician who referred me to a dermatologist who conducted a skin patch test. The test showed I was allergic to nickel. Since I don’t wear any jewelry or experience contact dermatitis when I touch things high in nickel, my dermatologist suggested I try the low nickel diet for one month. After a month I met with him to discuss the outcomes of trying the low nickel diet. My eczema symptoms had nearly disappeared. It actually felt like a mini miracle and I’m not religious. There are moments when I still challenge myself to see whether or not I continue to be allergic to foods high in nickel. I may eat a salad; enjoy a bowl of potato leek soup or a piece of triple berry pie. Time and time again, I experience severe eczema that only lasts a couple days. Yet it affirms my nickel food allergy. Since my nickel food allergy doesn’t cause me anaphylaxis, I can safely experiment with my diet in this way. If you try experimenting with your diet, it might help to keep a food journal. I only restrict my diet by eating the low nickel diet as method to treating and preventing severe eczema or atopic dermatitis flare ups. I wouldn’t eat the low nickel diet if I didn’t have to, but I’ve found it very effective for me. I’ve heard from so many others that the low nickel diet has worked for them in reducing their eczema and other internal symptoms caused by their nickel allergy. 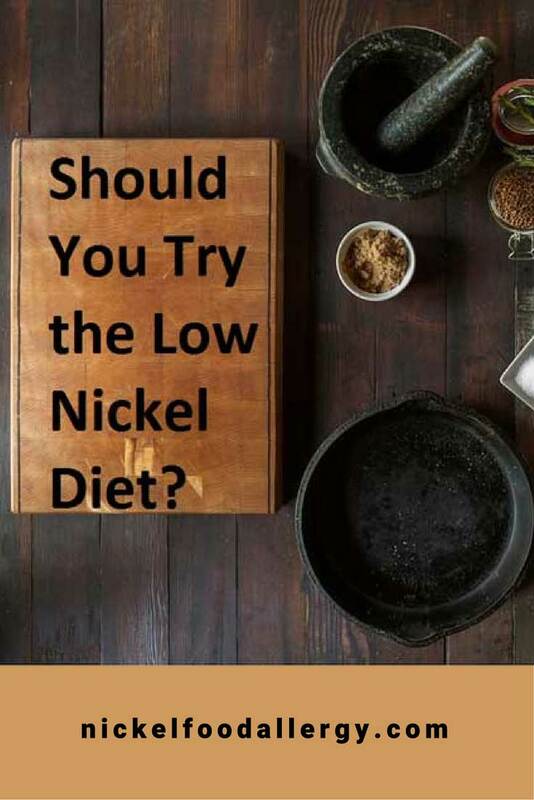 One of the most challenging aspects is that it takes time on the low nickel diet to truly experience it’s positive effects. It took my body about 4 weeks on the low nickel diet to totally clear up my severe eczema I’d experienced for nearly a year! 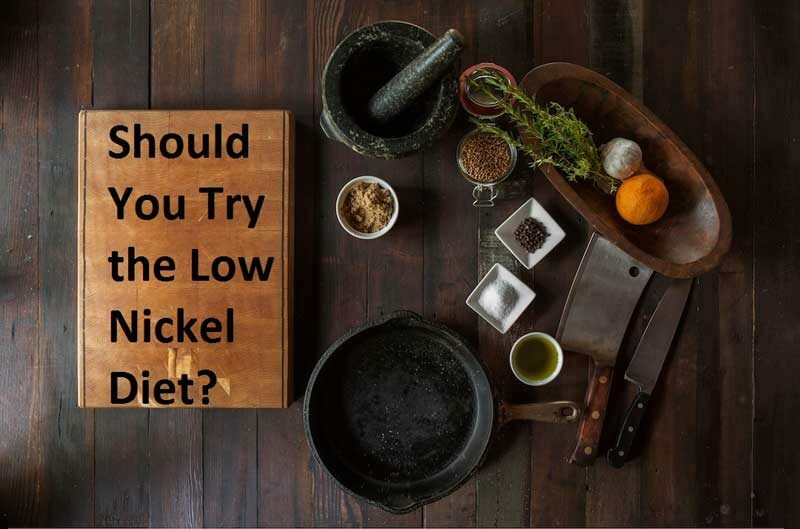 If you’ve tried the low nickel diet or still work towards not eating high nickel foods, I’d love to hear you thoughts about the low nickel diet in the comment section below. Verrill, L., Bruns, R., & Luccioli, S. (2015). Prevalence of self-reported food allergy in U.S. adults: 2001, 2006, and 2010. Allergy and Asthma Proceedings,36(6), 458–467. http://doi.org/10.2500/aap.2015.36.3895. The low diet diet has made a tremedous improvement in my daughter’s skin issues. She used to keep a cooler of wet towels with her at work for relief when the itching became unbearable. Thank God she was correctly diagnosed with a nickle allergy. I cant tell you how many doctors out there, well respected allergists included, who seem to have no clue, but she persisted and finally got a diagnosis. I would advise others to not give up – there are some good major clinics in this country. What do you suggest for Omega 3? She had a severe reaction to fish oil that had mackerel in it. I supposed she will try another brand, but do you or anyone else have any suggestions? That’s wonderful the low nickel diet has tremendously improved your daughter’s skin issues. Getting a correct diagnoses can be challenging and I’m also glad she didn’t give up. Can she eat fish? I eat salmon, tuna, halibut and cod. I’ve heard fish oil supplements don’t really do much. Since supplements aren’t regulated, I don’t really take them. If I take any supplements I prefer the NatureMade brand. Exactly what seafood fish should I avoid? My list says to not eat shrimp. How about salmon, cod, or tilapia? Thanks for your comment. I too avoid shellfish, which includes shrimp, crab and lobster. However I will eat salmon about once a month (preferably from the Pacific, instead of the Atlantic), cod, tuna, halibut, scallops. Typically fish is better fresh fish tends than frozen, as frozen foods can have histamines and many of us with nickel allergies experience eczema when we eat foods higher in histamines, yet frozen is better than canned as the nickel from the stainless steel can, can be problematic. Christy, I have been on the low nickel diet for a couple of months and it has improved my hand eczema tremendously. However. I have peripheral neuropathy and it is in a flare. I am guessing this is due to low magnesium. I am writing to you because you stated that you did not take a lot of supplements and I would like to avoid these also. But, I cannot find any low nickel, high magnesium foods. What would you suggest? Thanks for your comment. You are correct that many foods higher in magnesium are also higher in nickel. I didn’t know or consider the possibility of neurophy because of a magnesium deficiency. I have started taking a magnesium and vitamin D supplement, not every day, but a couple times a week. There’s also a homemade magnesium oil spray recipe Wellness Mama writes about on her blog that could be a useful alternative. Sometime in the future, I hope to write about the possible correlation between magnesium deficiencies and nickel food allergies. Where can I find this low nickel diet? 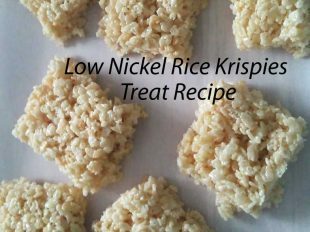 The low nickel diet involves limiting your intake of foods high in nickel. There are other resources you might find useful on my resources page. Hello and thank you for sharing your experience! for 2 years I make a nickel-free diet very strict and today I would like to try to taste food again. I am very afraid of anaphylactic shock, do you think that this food allergy can make one? Allergists do not agree in my country. I dream of chocolate! Thank you for your reply !! Thanks for your comment and appreciation for my website! Barbara from Nickely Challenged has said she’s experienced anaphylactic shock when she drinks tap water instead of bottled water. I don’t eat chocolate, but I do feel lucky that I don’t experience anaphylactic shock when I eat foods higher in nickel. I’m not a physician and can’t speak to what’s in your best interest. 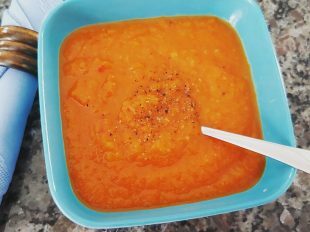 There is a great private Facebook group that focuses on food, you might find helpful called Low Nickel Diet-Eating Well with Nickel Allergy/SNAS. I have been diagnosed with nickel allergy as well as dust-mite allergy last week. For more than three months now, I have had rash, urticaria, eczema, itchy skin all over my body (including my eyes and face). The worse was at night when it woke me up and it was so itchy. I couldn’t find what it is and went to see different doctors and now I got the results from an allergy specialist. He recommended me the low nickel diet. I started it 5 days ago. However my skin is still itching , I have some urticaria in different places of my body. I am wondering how long it should take? He advise me this diet for 3-4 weeks, am I going to see the results soon? or should I do eat longer? My last question is with this diet, I am suffering from constipation and do not evacuate anything. I don’t know if it is normal and if you encountered this issue as well? I used to eat a lot of fibers and this diet is low fiber which does help me to go to the bathroom. Thanks for your comments and congratulations on your blog. Thanks for your comment and appreciation for my blog! My dermatologist initially recommended I try the low nickel diet for 3-4 weeks too when I was first diagnosed. I don’t know of anyway to “detox” nickel from our bodies, so I think time of not eating high nickel foods is why the 3-4 week timeline is recommended. If you’re eczema/hives aren’t resolving after a month on the low nickel diet, then perhaps your doctor will try another treatment option or to continue it. For me there is a direct correlation-low nickel diet resolves my eczema and when I eat foods higher in nickel it comes back. In regards to fiber, I understand. 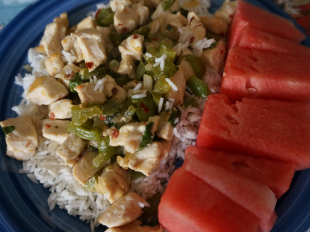 I write about fiber and the low nickel diet. I also take 1-2 teaspoons of benefiber in my water daily.